Based on information found in Stuart’s Finest Hour: The Ride Around McClellan, June 1862 by John J. Fox III copyright 2014 and published by Angle Valley Press. Ten minutes later he mounted up with his staff and moved northwest to skirt around the north side of Richmond. They headed to the bivouac site of the 9th Virginia Cavalry located on the rolling hills of the Mordecai Farm four miles north of Richmond and west of Brook Road. The 1st Virginia Cavalry had earlier departed their camps east of Richmond and preceded the staff to Mordecai Farm. 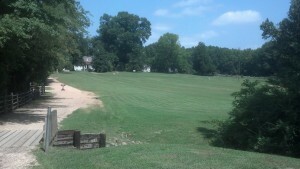 Mordecai Farm is now present day Joseph Bryan Park located on Lakeside Avenue just north of I-64. 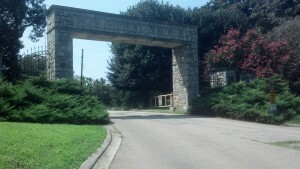 Begin the drive at the stone archway entrance to Bryan Park. Turn Left on Lakeside Avenue. Go ½ mile. Right on Dumbarton Road. Go less than a mile. Turn Left on Brook Road [Rt. 1]. Go 2.8 miles. Turn Left on Parham Road and then immediate Right on Hungary Road. Turn Right on Hungary Springs Road. Turn Left on Old Rt. 33. Pass Warren Road and Turn Right on Courtney Road. Follow Park loop and return to Mountain Road but Turn Right. At Fire Station Turn Right on Mill Road. Cross RF&P R.R. and Turn Left on Old Washington Hwy. Left on Greenwood Road [Rt. 625] and cross bridge back over RR tracks. Turn Right on Winns Church Road [Rt. 660]. Turn Right at Cedar Lane[Rt. 623]. Turn Left at Elmont Elementary School on Karen Lane [Rt 772]. Turn Right on Elmont Road [Rt. 626]. Cross RR tracks and turn left into vacant lot. This is Elmont or CW era Kilby’s Station where Stuart’s column picked up a group of scouts. Retrace your route back west across RR tracks. You will come to Rt. 54 intersection & traffic light but stay straight on Blanton Road [Rt. 666] to T-intersection. Almost immediate Left Turn onto Elletts Crossing Road and go under RF&P overpass. 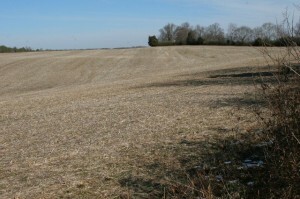 See rolling fields of Winston Farm where Stuart’s tired men bivouacked for night around sunset. Based on information found in Stuart’s Finest Hour: The Ride Around McClellan, June 1862 by John J. Fox III, copyright 2014 and published by Angle Valley Press. 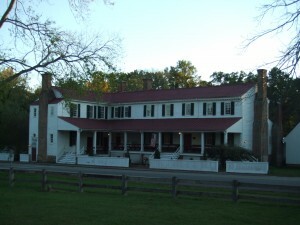 Before dawn on Friday, June 13, 1862 Stuart’s scouts returned to the Winston Farm bivouac site. They reported that the way to Hanover Court House seemed clear and that civilians had indicated that no Union defense works blocked the way until near Old Church, fourteen miles southeast of Hanover Court House. Continue past Winston Farm on Hickory Hill Road [Rt. 647]. Road will cross tracks of old Virginia Central. 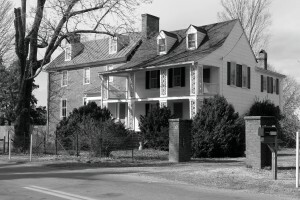 Just to the west is the home of Colonel Williams Wickham [4th Va. Cavalry] which is private property. Continue southeast on Hickory Hill Road until intersection with Patrick Henry Road East [Rt. 54]. Turn Left on Rt. 54 and make immediate Right on St. Paul’s Church Road. Pass the church and road will merge with slight Right onto Hanover Courthouse Road [Rt. 301]. Continue southeast on Rt. 301 downhill across Mechumps Creek. To the right is the swampy area that Fitzhugh Lee’s 1st Va. Cavalry got stuck in as they tried to cutoff the 6th U. S. Cavalry patrol. A short distance farther you will pass the intersection with River Road [Rt. 605]. This is the area where the lead elements of Stuart’s column bumped into the 5th U. S. Cavalry patrol led by Lt. Edward Leib. Leib’s men reversed course and rode back along the River Road. Continue straight on Rt. 301 past River Road about 1 ½ miles to Left Turn at Georgetown Road [Rt. 651]. Continue down into Crumps Creek bottom past Taliaferros’ Mill. Turn Left on Studley Road [Rt. 606] and head east past Enon Church. About 1 mile past Enon Church you will come to road junction at Studley which during the war was called Haws Shop. Here is where Stuart’s column surprised and overwhelmed videttes from the 5th U.S. Cavalry. Continue straight east on Studley Road [Rt. 606] but take notice that just past Studley you will see Summer Hill Road [Rt. 644] on the left. Several miles down this road are Westwood and Summer Hill, two houses that figure prominently in the burial of Captain William Latane [see Appendix B]. Stay on Studley Road [Rt. 606] all way to Totopotomoy Creek Bridge. 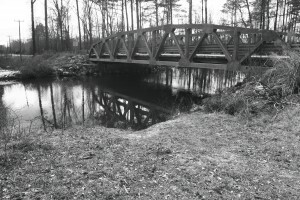 A running battle between Stuart’s men and the 5th U. S. Cavalry ensued from Studley [Haws Shop] to the Totopotomoy Creek bridge. Patrols comprised of Lt. Edward Leib and Lt. William McLean’s Union troopers attempted a brief stand on the southeast bank of the creek until retreating up the Totopotomoy Creek ridge. 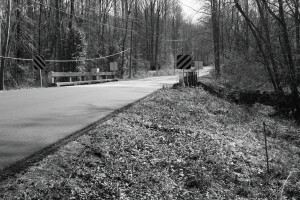 Route 606 at Totpotomoy Creek Bridge looking southeast. For short time 2 Union patrols formed a defensive position on far bank. Cross the bridge and continue uphill on Studley Road [Rt. 606]. Here is where the Confederates expected an ambush so the 9th Virginia Cavalry’s captain William Latane received an order “to move forward and clear the road” with his squadron [companies E & F]. Note the heavily wooded steep terrain as you drive uphill. General Lee wanted to know specifically whether this ridge was defended by Union troops which was why he sent Stuart on this recon mission. Continue southeast on Studley Road. A running battle continued to where Bethesda Road [Rt. 634] turns right. This is where the Linney House stood. Stuart’s men stopped here to regroup and Royall’s men escaped east to Old Church. Stay on Studley Road [Rt. 606] and come to big intersection with Mechanicsville Pike [Rt. 301]. Several miles to the southwest on Rt. 301 was the location of BG Fitz John porter’s Union 5th Corps. Go straight southeast on Rt. 606 which now changes its name to Old Church Road. About 1 ½ miles later you will drive into Old Church. Old Church Tavern sits to left [it is a private residence so please respect that]. Drive past McClellan Road [Rt. 628] and on right before the Immanuel Episcopal Church was the bivouac site of Captain William Royall and his four companies of the 5th U.S. Cavalry. Stuart’s column led by the 1st Virginia Cavalry captured the camp supplies and burned what they could not carry. This is the spot where Jeb Stuart had to make a big decision whether to retrace his route back toward Hanover Court House or continue deeper behind Union lines. Former Old Church Hotel which is now private property. Continue east on Old Church Road [Rt. 606] almost 8 miles. Look for Left Turn onto Steel Trap Road [Rt. 607]. This dirt road will go just less than 1 mile to Garlick’s Landing where two Confederate squadrons attacked and routed the small Union supply depot capturing prisoners, supplies, horses and mules and setting several boats on fire. While they attacked this depot, Stuart continued on ahead southeast on Old Church road [Rt. 606] with the rest of his men. The two squadrons later rejoined the column at Tunstall’s Station. Continue east on Old Church Road [Rt. 606]. 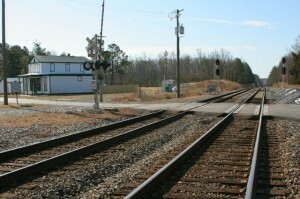 Cross railroad tracks and make Right on Tunstall’s Station Road. Stop at Virginia Civil War Trails sign which outlines what happened when Stuart’s men attacked and captured the small Federal garrison that guarded the rail depot. Return to Rt. 606 and turn right. Continue for several miles and Rt. 609 will merge from left. Continue straight but note that road becomes Rt. 609. A short distance after this merge you will see Rt. 642 on Left which will lead you to St. Paul’s Church. Note several images of church in book. Return to Rt. 609 and turn Left. Go short distance to traffic circle which is Talleysville/Baltimore store where Stuart’s men plundered a large sutler’s operation just before midnight of June 13. The advance and front of the column rested here for about three hours as they waited for the rear to catch up. At around midnight they departed. From traffic circle head east on Rt. 249. From Talleysville traffic circle head east on Rt. 249. Go short distance and turn Right on Olivet Church Rd [Rt. 618]. After several miles you will pass historic Olivet Church. Continue to Rt. 60 and turn Right. Go 6/10 of a mile and turn Left on Rt. 618. You will pass entrance to Sycamore Springs [private residence] the former home of Lieutenant Jones Christian. Road is closed [as of 9/2013] for bridge repair. When road is reopened, Christian Ford is located just east of the bridge. Because the river was flooded on June 14, 1862 Stuart then led the column downstream to the burned Forge Bridge. Retrace your way back to Rt. 60 and turn Right. Drive to Providence Forge. Turn Right on Rt. 155 South toward Charles City. The location of Stuart’s bridge crossing site is just east of the modern Chickahominy River bridge. The old road trace to the old bridge is visible just left of modern road. Be careful if you elect to stop here as there is limited space to pull off. Cross river and continue on Rt. 155 South. Note that after about 1 ½ miles you will pass Rt. 610 on right. This is probably the road that the column took to head toward Thomas Christian’s house [Green Oak] but today it dead ends into private property. Continue on Rt. 155 South several more miles and turn Right on Rt. 602. Go to intersection at Adkins Store and turn Left on Rt. 618. After several miles you will see Bethany Presbyterian Church on right with historic marker. Continue on Rt. 618 to intersection with Rt. 5. Turn Right on Rt. 5 headed toward Richmond. After several miles you will come to a curve and entrance to Berkeley Plantation on left. On right you will see Richard Rowland’s house and mill where Stuart and two scouts stopped for coffee. Follow Rt. 5 back to Richmond. Near Richmond you will pass Rockett’s Landing on left where port for Richmond used to stand. Rt. 5 will turn into East Main Street. At 25th Street turn Left. At East Cary Street turn Right and go to intersection with 20th Street. Here is former location of Libby Prison where Union prisoners captured on raid were dropped off.